Do you love your air fryer like we love ours? 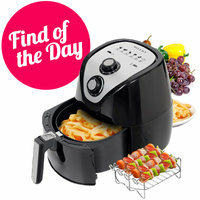 Or are you looking for an excuse to get yourself an air fryer? Either way, we’ve got you covered with recipes and an Amazon find that’s a total bargain! In a wide bowl, mix breadcrumbs with seasoning. Cut zucchini into quarter-inch-wide coins. Place in a second wide bowl. Top with egg, and flip to coat. One at a time, shake zucchini coins to remove excess egg, and lightly coat with breadcrumb mixture. 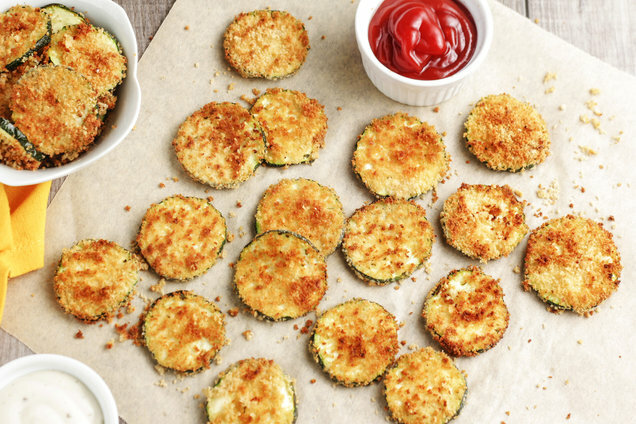 Place zucchini in the air fryer in a single layer, and top with any remaining seasoned crumbs. Set air fryer to 392 degrees. Working in batches as needed, cook until golden brown, 8 - 10 minutes. Oven alternative! Bake at 400 degrees until golden brown, about 20 minutes, flipping halfway through. HG FYI: Can’t find whole wheat panko? Use regular panko, which has slightly less fiber. This particular countertop appliance is like the crown prince of air fryers. It’s not the biggest or flashiest, but people are OBSESSED with it. We love that it comes with mini skewers, a BBQ rack, AND a 2-year warranty... all for under $60! It’s highly likely this Amazon’s Choice selection is going to sell out, go snap it up while you can. And if it’s already sold out by the time you click, check out these other top-rated air fryers! Hungry for More Air-Fryer Recipes? Time to air fry! As an Amazon affiliate, we may receive compensation from some of these links. Prices and availability accurate at time of publication and subject to change. Happy National Greasy Foods Day, October 25th! Thanks to the air fryer, you can enjoy classic “junk food” without all the grease... Now that’s worth celebrating! Help your pals make amazing fried-food alternatives! Click "Send to a Friend" now.